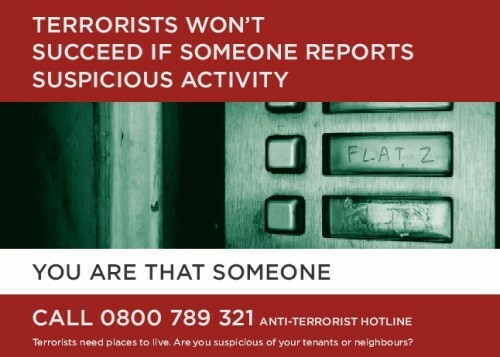 A new government commercial currently running on one of Britain's most popular radio stations is selling one thing -- fear -- by encouraging Londoners to report their neighbors as terrorists if they use cash, enjoy their privacy, or even close their curtains. The advertisement, produced in conjunction with national radio outlet TallkSport, promotes the "anti-terrorist hotline" and encourages people to report individuals who don't talk to their neighbors much, people who like to keep themselves to themselves, people who close their curtains, and people who don't use credit cards. "This may mean nothing, but together it could all add up to you having suspicions," states the voice on the ad, before continuing "We all have a role to play in combating terrorism" (we're all indentured stasi informants for the government). "If you see anything suspicious, call the confidential anti-terrorist hotline... if you suspect it, report it," concludes the commercial. Listen to the ad below. That's right, if you are trying to stay out of debt by not having a credit card, you're obviously a prime candidate to be a suicide bomber. If you're watching television or using a computer monitor and want to keep the sun off the screen by closing your curtains, you're probably operating at the behest of Osama bin Laden. If you'd rather not let the entire neighborhood know your business then you could be planning to hijack planes and crash them into buildings. Of course, the sheer lunacy of this commercial on the face of it doesn't need to be explained in any depth. What's infinitely more disturbing is the deeper message the government is trying to force upon the public -- that everyone has a responsibility to act as a citizen spy, a Stasi informant working for the state, and that everyone is under constant suspicion no matter how apparently benign their behavior. This has nothing to do with catching non-existent terrorists and everything to do with creating the perception that anyone who attempts to live their life even marginally outside of the system, by not having a credit card for example, is a potential danger to the rest of the sheep who have chosen to remain firmly inside the confines of the pen. This is about getting the other inmates to police any other prisoner who dares to step outside the boundary of the cell. Another aspect is the accelerating attempt to create a cashless society where every transaction is tracked and recorded. To predominantly eliminate the use of cash, it has to be demonized as suspicious, dirty and criminal. People who have been reading this website will know that we have tracked the evolution of these kind of campaigns with increasing horror at their resemblance to the darkest days of Stalinist Russia and Nazi Germany. Similar previous "anti-terror" campaigns have featured posters that imply people who get refunds, live in apartments, or drive vans should be reported. Does that sound incredible? It's true, the London Metropolitan Police actually ran a campaign encouraging people to report individuals as potential terrorists because they had a home, under the slogan, "Terrorists need places to live. Are you suspicious of your tenants or neighbors?" A more recent campaign encouraged citizens to study the contents of each others' trash and report anything suspicious, as well as to grass up individuals who glanced at the millions of CCTV cameras that line every major street in the country. Staring back at big brother is a sign of terrorism, according to the British government. People who use mobile phones, cameras and computers were also labeled suspected terrorists. As America and Britain sink deeper into militarized police states, society begins to parallel more and more aspects of Nazi Germany, especially in the context of citizens being turned against each other, which in turn creates a climate of fear and the constraining sense that one is always being watched. One common misconception about Nazi Germany was that the police state was solely a creation of the authorities and that the citizens were merely victims. On the contrary, Gestapo files show that 80% of all Gestapo investigations were started in response to information provided by denunciations by "ordinary" Germans. "There were relatively few secret police, and most were just processing the information coming in. I had found a shocking fact. It wasn't the secret police who were doing this wide-scale surveillance and hiding on every street corner. It was the ordinary German people who were informing on their neighbors," wrote Robert Gellately of Florida State University. Gellately discovered that the people who informed on their neighbors were motivated primarily by banal factors -- "greed, jealousy, and petty differences," and not by a genuine concern about crime or insecurity. Gellately "found cases of partners in business turning in associates to gain full ownership; jealous boyfriends informing on rival suitors; neighbors betraying entire families who chronically left shared bathrooms unclean or who occupied desirable apartments." "And then there were those who informed because for the first time in their lives someone in authority would listen to them and value what they said." Gellately emphasizes the fact that the Germans who sicked the authorities on their neighbors knew very well what the consequences for the victims would be -- families torn apart, torture and internment in concentration camps, and ultimately in many cases death -- but they still did it with few qualms because the rewards of financial bounties and mere convenience were deemed more important to them. This strikes at the root of the selfish and childish urges the government is trying to manipulate in getting people to report on their neighbors. The self-important feeling of being listened to, ascribed some temporary sense of authority, and the cult-like pavlovian reward of being metaphorically patted on the head by someone in a uniform, are all tendencies such campaigns play on. However, if we don't want to end up in a society that exists in a constant state of tyranny and fear as in Stasi East Germany or Stalinist Russia, we must learn that our neighbors are not our enemies, and that the only real threat against which we need to unite is an oppressive state that tries to destroy us by turning us against each other.